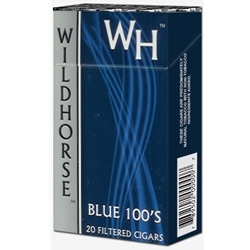 Wildhorse Light Filtered Cigars are available in Box 100's and packaged 20 cigars per pack, 10 packs to a carton for a total of 200 premium filtered cigars. Wildhorse Filtered Cigars uses a premium a blend of American made tobaccos that is light and smooth on the draw, yet delivers a distinct flavor and aroma that is unique to these cigars. Smokers Discounts has a variety of Wildhorse styles available to help save you money. Call our customer service today for more information about this brand.